July, 2018: One shared characteristic of the Age of Trump is our ongoing sense that it just can’t get any crazier than this – and our regular, almost daily recognition that in fact, it has. Still, like all true believers in American innocence, we go on, insisting that the horrors perpetrated in countless times and places within our own lifetimes just can’t happen here. In fact, they have indeed happened here. Even though many Trump supporters would rather not be reminded that their ancestors came from other lands, a fundamental part of the American story that we tell ourselves remains: out of many we became one – except, of course, for whomever we currently designate as the Other. And, in our demythologized world, defining that Other in the starkest of terms, as threat, as pollution, as corruption of the pure blood is how an increasingly smaller part of the American population thinks of itself as “one.” We are talking about a project of white supremacy that has been the most fundamental part of our story since the beginning. Mythologists understand that every national narrative has its shadow, the part of the story we have suppressed so deeply that we’ve forgotten it, perhaps out of fear of what I have called the “return of the repressed” (see Chapter Four of my book). The shadow of E Pluribus Unum insists that we can’t speak about how we became one people without considering settler colonialism, genocide, slavery, capitalism and the construction of “whiteness.” We must address how those privileged enough to achieve entrance within the pale were granted permission to help determine who was outside the pale, how some might be admitted within the pale, and how they might be forced to impale others on the projection wall of otherness. We must understand how defining others as outside has been the primary way in which we have known who we are on the inside. Any mythology that is built upon contradictions, such as ours, is extremely unstable. And every time its basic assumptions come into dispute, as they regularly do, we experience on a mass scale the need to re-examine ourselves and re-encounter the question of who we are. And Americans, unlike any people before or since, have always understood who we are only by determining who we are not. This is the genesis of white supremacy (as I discuss in Chapters Seven and Eight of my book), and it goes a very long way toward explaining both the sense of anxiety that threatens to overwhelm us, and the voters, most of them evangelical Christians, who still support Donald Trump. Consider some of the primary players in American immigration myth: Black people, Latinos and Native Americans remain imprisoned as America’s perpetual “inner Other,” while the “outer Other” in all of its changing images (Indians, communists, Mexicans, Eastern and Southern Europeans, Asians, Russians and of course Muslim terrorists) is always located beyond the borders, beyond the pale. But the immigrant plays a curiously ambiguous role in the narrative of American innocence. Immigrants are outsiders who in aspiring (or threatening) to be in transition to becoming insiders, force insiders to question something we quite ambiguously refer to as the American Dream. To the Paranoid Imagination, however, they threaten to pollute that dream. A further ambiguity is that their condition is qualified by their skin color. The story of American immigration announces a welcome to all that is enshrined on the Statue of Liberty: “Give me your tired, your poor, your huddled masses yearning to breathe free…” There may be no poetic line better known in the entire world. But this story – the Melting Pot, or the Ellis Island myth – is rife with such contradictions that its adherents have required an entire mythology to resolve them, a massive, ongoing, national, cognitive dissonance. When facts meet myth, it is the truth that must change to fit the myth. Five factors (race, religion, economics, politics and empire) have deeply influenced the mythology of immigration. There’s been a very strong racialized component in our ideas about who can be a citizen and who can even be considered an immigrant. 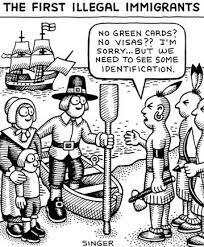 Historically the term immigrant has had different meanings. People of color who were entering the country during most of its history were not considered to be immigrants at all. They were considered to be workers, who were allowed to be here but not as immigrants, per se. Religion: Protestant Puritanism, with its demonization of the poor, was enshrined as a fundamental part of White identity from the beginning. For these same 250 years, America was essentially a white, Anglo-Saxon, Protestant nation (with the exceptions of Louisiana, Maryland and the distant Southwest), and it perpetuated the Reformation demonization of Catholics. By the 1830s a large political movement of ironically-titled “nativists” who shamelessly called themselves the “Know-Nothing” Party attained considerable political influence with a single platform that resisted Catholic, especially Irish, immigration. It was the first example and certainly not the last, of “America First” arguments. And it was the first example of many in our history when large numbers of citizens were proudly, shamelessly intolerant of other white people. In 2018, as Trump has given millions of whites permission to act out their nastiest fantasies, the word “shameless” has become a statement of pride, for perhaps the first time in 180 years. From this perspective, our working question is always: Qui bono? (Follow the money.) And since the beginning of this century, it has been a question of very large amounts of money, with entire industries emerging to service the policing, interrogation, incarceration and deportation of immigrants. Politics: After economics, the opening and closing of the gates to citizenship have always been political rather than moral decisions. Prior to and during World War Two, anti-Semites controlled the State Department, and the U.S. refused to admit more than a trickle of Jewish refugees from Europe (including Anne Frank’s family), leading to the shameful story of the S.S. St. Louis. Especially since 1975, people from unfriendly or socialist countries (Nicaragua, Viet Nam, Iran, the U.S.S.R. and especially Cuba) have easily achieved admittance as political refugees, while those attempting to enter the U.S. from friendly or right-wing countries (Guatemala, El Salvador, Honduras, Indonesia, etc), despite the overwhelming evidence of mass human rights abuses, have rarely been granted that status. In recent years the U.S. has allowed in very large numbers of South Asians (primarily Indians and Pakistanis), primarily because of the needs of the computer industry. Israelis are another special case, having unlimited immigrant privileges, while others from their region are highly monitored. The case of Cuba vs Haiti is our best example of how politics influences immigration policy – and is in turn influenced by it. Cubans, perceived as obvious antagonists (if not enemies) of their own government, have enjoyed free admittance for decades, and they have constituted a solid right-wing constituency in Florida that clearly determined the Presidential elections of 2000 and 2004. Can you imagine the course of American – and world – history since the year 2000 had Florida not “voted” for George W. Bush (or if a quarter of African Americans in the state had not been ineligible to vote)? Haitians, by contrast, have nearly always been subjects of governments friendly to the U.S., and they have been forced to endure the most extreme privations to be allowed onto American shores. But defining the Haitian boat people as economic rather than political refugees allowed the U.S. to refuse asylum to thousands and immediately deport them, even as Cubans found housing and jobs. And even within the artificial category of “Latins” we have to note that Cubans are primarily brown and Haitians are black. Mexicans have suffered the worst effects (and ironies, since their ancestors arrived long before whites) of America’s changing political and economic conditions, as we will see below. It is a clear marker of our American innocence that in the age of Trump we still have to remind ourselves that White Europeans conquered this land through genocide. This was an original sin so overwhelming that its perpetrators and their descendants, many of whom were religious extremists, could only live with themselves and their crimes by demonizing the surviving Native Americans. This is absolutely critical: the ideology of Puritanism remains alive and well today. And politicians continue to blame the poor for their condition, because they know full well how many of us still subscribe to this mad belief system. From that stance, it is a simple matter to blame even refugees from oppression as complicit in their suffering. It’s a commentary on our current debased state of public discourse that we even have to state this. White people are not indigenous here, and for four centuries our existence here has been marked by the deep anxiety of people who know very well that they are themselves “Other.” We live with this painful knowledge by “othering” those who can’t or won’t fit our definitions of being American. I’ll put it into the simplest of psychological terms: I am a sinner and I secretly hate myself, but I cannot live with such knowledge unless I repress it and project it onto you. Empire: A final, often unspoken factor is the question of how Americans, from the start – indeed since before independence – have expanded, conquered, massacred, fomented military coups and stolen resources from every nation to the west and south that had the misfortune to be on the other side of those expanding borders. This immense contradiction became such a fundamental aspect of the myth of exceptionalism that now, few Americans have any idea (or would object if they knew) that U.S. armed forces are placed in over 180 sovereign nations. Specifically for the three countries putting most refugee pressure on the southern border – El Salvador, Honduras and Guatemala – the crisis, writes Mark Tseng-Putterman, has been created by a century of U.S. economic and military intervention. Here is another contradiction in the simplest terms: Americans historically fear the incursion of the Other even as their sons – and now daughters – die fighting within the borders of dozens of countries, for no justifiable reasons, and certainly not at the invitation of the majority of citizens of those countries. We meet the word “shameless” again. Doesn’t it seem natural that all white persons arriving in the New World between 1600 and 1800 must have wondered, even if only momentarily, why they should be so privileged over the natives? I imagine that at least some of them felt considerable shame and guilt about their participation, even as servants, in the theft and genocide of an entire hemisphere. It took the attraction of the evolving myth of America – a new world of opportunity, an empty land ripe for the taking – to override the natural ethical standards of common people. The phrase “A land without people for a people without land” was so attractive (if utterly false) that 19th century Zionists used it (equally falsely) in their arguments for a Jewish homeland in Palestine. This is how settler colonialism justifies itself. So it really shouldn’t surprise us that one of the first laws established by the new, independent Congress of the United States, the Naturalization Act of 1790, proclaimed that “…any alien, being a free white person, may be admitted to become a citizen of the United States.” Blacks, Mexicans, Indians (Native Americans) and most women were not citizens. Above all, the myth spoke of freedom. For 250 years, these citizens were white, Christian (the vast majority Protestant) and free, if not always able to vote. All three of these characteristics were necessary components of the meaning of “American.” Conversely, to be black, with few exceptions, was to not be free, and thus to not be a citizen. Indeed, when the end of the Civil War determined that all were free, new, informal definitions of “white” (having to do with acceptable forms of dress and behavior) became necessary. This is what started to change the country’s ideas about immigration because now people of color who came into the country could not be permanently maintained in a sub-caste and not considered immigrants because they were going to have children who would be citizens…racially restrictive immigration legislation started after the Civil War precisely to address this problem in the eyes of Congress that people of color were now going to be able to obtain citizenship by being physically present, and then having children who would become citizens by birth…There was a very strong push to racially restrict immigration in order to maintain the whiteness of the country, and that started with the restrictions against Asians, the Chinese, Japanese, and then all Asians…they were not considered immigrants because they were not eligible for citizenship. At the same time, there were very clear political implications. From the very start, the myth encouraged “Americans” to identify as white, rather than as members of a downtrodden social class. At every juncture when poor and working class people began to organize, the full weight of the media and religious gatekeepers succeeded in driving a wedge between blacks and whites. And it encouraged them, once their conditions improved even slightly, to look down upon the next wave of immigrants. Even so, for 250 years, “immigrant” was almost always a positive term that described primarily white, European Protestants who came to take advantage of the opportunities America offered, and who in turn helped to build the nation. The inconvenient truth that slavery was the major economic engine that actually did that was omitted from the story. And that corruption of historical knowledge is clearly making a comeback even now in our schools. A new mythic promise of America developed, expressing fecundity, growth and the happy labor of idealized, Jeffersonian farmers: the “garden of the world.” Although this story is no more accurate than that of the cowboy, it survives because it embodies fantasies of simpler, happier times and independent ownership of land. Such ownership (for whites) was possible, of course, only if the frontier continued to expand into Indian Territory. These “sturdy” family farmers, backbone of the country in war and peace, were the spirit of democracy. Neither rich nor poor, they owed no one and exploited no one. They gave to the myth of the garden another fundamental characteristic: the West (the Midwest, the heartland) was racially homogeneous and classless. This powerful and historically unique narrative attracted millions of immigrants in the last quarter of the nineteenth century. Americans were free and equal. In the early 1860s the federal government began distributing Western lands free to citizens or anyone who declared their intention to become citizens. Eventually it granted 1.6 million homesteads and distributed 270 million acres of federal land – an area close to the land mass of both California and Texas – for private ownership. Homesteaders received nearly ten per cent of all the land in the entire U.S. for little more than a filing fee. However, after 1865 “freedom” no longer defined whiteness. So new laws and practices prevented most blacks from acquiring western land. This kept them in the South as sharecroppers, or de facto slaves. A second law, the Southern Homestead Act (SHA) came into effect in 1866. During its first year, unoccupied southern land was offered exclusively to African Americans and loyal whites, but after 1867 even landless former Confederates applied. By the end of the SHA 10 years later, nearly 28,000 individuals had achieved ownership of land. So, due to these two Homestead Acts, over 1.6 million white families – both native-born and immigrant – became landowners during the next several decades. But only 5,000 African-American claimants ever received final land patents from the SHA. Homestead Acts were unquestionably the most extensive, radical, redistributive governmental policy in US history. The number of adult descendants of the original Homestead Act recipients living in the year 2000 was estimated to be around 46 million people, about a quarter of the US adult population. If that many white Americans can trace their legacy of wealth and property ownership to a single entitlement program, then the perpetuation of black poverty must also be linked to national policy. Indeed, the Homestead Acts excluded African Americans not in letter, but in practice – a template that the government would propagate for the next century and a half. In other words, homesteading became a privilege of whiteness, and in the southwest similar systems targeted Latinos. No wonder our picture of the “hardy pioneers” is lily-white.